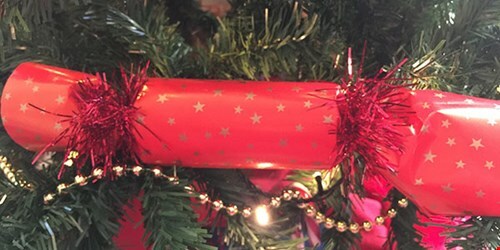 Keep the costs down this Christmas and give your dinner table that personal touch by making your own crackers. I love Christmas but every year I’m disappointed with the Christmas crackers. Whether it’s the terrible jokes or the cheap toys, they always fail to live up to my idea of a decent cracker. Then there’s the issue of the design. I usually find I’m limited to gold, silver or cartoony designs, unless I spend a lot of money to get ones that we really want. 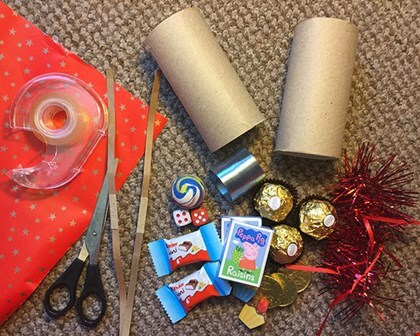 With that in mind, this year we’re going to make our own Christmas crackers. Not only will it be a bit of fun, but we’ll also be able to decide what goes in the crackers which, in my opinion, will make this Christmas a winner. Lay the toilet roll on the gift wrap and measure out enough to wrap around the roll and have some spare on the ends to pull. Feed the banger into the toilet roll and stick it down on each end using the sellotape. Roll the gift paper around the toilet roll and stick in place. Add a bad festive joke, a little chocolate treat or even a small gift into the tube. Twist the ends of the paper and tie around them with a little ribbon. Then repeat for as many guests who you’ll have on Christmas Day. For the fillings, we pick up a few mixed packs from the pound shop, meaning everyone will have something they like. Christmas candy, mini packs of raisins or something all work just fine. If you want to add a cheesy festive joke you have the option to include whatever you want. I always try to think about who’ll be the one opening the cracker and add a joke accordingly. Just make sure you add a gift tag with a name, so the right person opens it. You may have lots of suitable jokes in mind but if you need some inspirational (and want to waste a bit of time chuckling) then there are many sites packed with jokes.